Sending command is very easy with Telegram interface. You can check below video to see how can send commands. /mute : Enable/Disable Robostopia™ Assistant Profit notifications. /status : It brings latest updates about your Profit/Loss Report and Completed Orders. /loss : It brings your LOSS report. /balances : It brings your all balances on Exchange. /buy : You can place BUY order (/buy NXT amount or all or all/4 or %25). Optionally you can set BUY PRICE as SATOSHI (/buy NXT amount SATOSHI) If you set SATOSHI, Auto Renew Order (ARO) feature will be disabled for this transaction. /buy_TSL : You can place BUY order with Trailing Stop-Loss (/buy NXT amount or all or all/4 or %25). Optionally you can set BUY PRICE as SATOSHI (/buy NXT amount SATOSHI) If you set SATOSHI, Auto Renew Order (ARO) feature will be disabled for this transaction. /sell : You can place SELL order (/sell NXT amount or all). Optionally you can set SELL PRICE as SATOSHI (/sell NXT amount SATOSHI or /sell NXT all SATOSHI) If you set SATOSHI, Auto Renew Order (ARO) feature will be disabled for this transaction. /tether : It brings latest TETHER report. You can also send any coin tickers like btc or eth ot ltc. 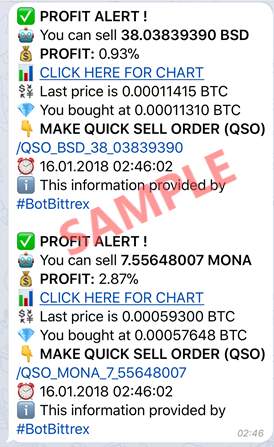 Bot will tell you latest price of the coin.